If you own a small business and tackle your website and marketing yourself, this post is for you. 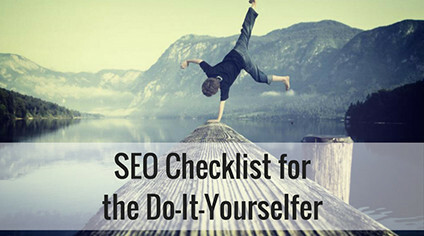 Here is a nine-point, SEO checklist you can use to help your website, product, and brand gain online traction. Know your target market (buyer persona). Research keywords associated with your product, brand, service, and buyer (tools – Google AdWords, iSpionage, Twitter, Hashtagify.me, Moz.com, SEMRush, Wordstream). Research competitors’ keywords (SEMRush, iSpionage, Internet Marketing Ninjas). Find a great list of free, SEO tools here. Create local business listings on Google, Bing/Yahoo! Include relevant keywords on your website, local business listing, and social media. Use the keywords in titles, description, and keyword tags; image alt tags and file names; and in page and blog post content. Create unique, keyword-rich content to share on social media and marketing platforms. Leverage social media, hashtags, and keywords to expand brand reach & find new leads. Spend money on advertising to your target market leveraging keyword research and URLs with keywords in them. Ensure Webmaster tools are associated with your domain. Use Google Analytics Acquisition > Search Console > Queries report to view the keywords people are using to find your site. How-to video. Now that you’re armed with the tools you need, set a schedule and begin working your way down the list. What SEO questions or tips do you have?